What can I expect from Jim Carrey as the lead actor? His acting really great. I really love his facial expressions and his gestures. His movie? Nice story, nice comedy. I was kinda late to watch this one. Just like what I did with Christmas Carol. I thought this one was similiar to Bruce Almighty, when he got a 'power' beyond himself and he totally changed from a looser to a winner personalities and also became lucky. But Yes Man offers a different cause. There's no magical things. Yes, he was a coward when it came to opportunities. It was better to be at home and watching rented dvds than drinking with some friends. He became a lazy and 'no' person since divorced from his wife, Stephanie. One day, he join a 'YES' seminar after his 'crazy' friend invited him. After the seminar, he was challenged to always says 'YES'. See? No magic. And the story begin. 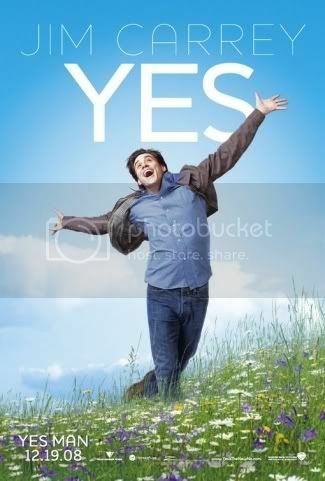 He kept doing 'yes' because he believed a good thing will happen if he say yes. Somewhat it was like unusual to see a lazy person changed to a brave and challenged man. I think it was a bit harsh to see the effect of the seminar, and how he kept doing it. The conflict seems unnatural because one day he got questioned by the intelligences. Then one by one problems smashed him, but he needed to keep saying 'yes' because he was afraid to break the covenant, and more bad things would come. Carl (Jim Carry) went to the Harry-Potter-Costumes-Party, with a girl whom he met on the first time he said 'yes'. Oh my God. I can't believe that I'm about to be like him if I can't wash off the laziness. Suddenly, I remembered about opportunities that had come but I declined. I always doubt myself when something coming (only that wasn't on my plan). First, I feel lazy. If I'm not, then I feel incompetent for the job. I was so scared my works wouldn't satisfy the other side. I always think that, "Hmm, 'A' should be better than me at this," or "I don't know whether I can make it or not," yeah, something like that. Just call it, I'm lack of confidence and lazy. I need to try saying 'YES'. YES! Coz 'yes' is the new 'no'.